President Obama is reportedly rethinking the withdrawal of U.S. troops from Afghanistan because of the recent gains made by the Taliban in that country. The New York Times, quoting senior officials, reports Obama appears to be willing to retain a military force strong enough to tackle Taliban and al-Qaeda. The president had wanted to withdraw the remaining 10,000 U.S. troops from Afghanistan by the time he leaves office next year, and, in fact, most combat troops left the country last year. The apparent White House rethink has been prompted by a confluence of factors: The Taliban’s capture of Kunduz late last month, the group’s biggest prize since it was removed from power by the U.S.-led invasion in 2001; the fact the militants are more spread out across Afghanistan than at any point since 2001; the continued presence of al-Qaeda in Afghanistan’s mountains; and inroads being made by the Islamic State, a group whose tactics and brutality the world is becoming increasingly familiar with in Iraq, Syria, and elsewhere. [A]t the very least, those pushing for an expanded mission after 2017 would like to see the United States and its NATO allies maintain at least two or three bases from which drones could be flown and Special Operations Forces could readily strike at militants. The Central Intelligence Agency also wants a larger presence to help protect its assets in Afghanistan. For now, the option that is being most seriously considered is a proposal made this past summer by Gen. Martin Dempsey, then the chairman of the Joint Chiefs of Staff, to keep 3,000 to 5,000 troops for the counterterrorism mission. The officials said that the Pentagon had also presented other options that range from just an embassy force of about 1,000, which mainly protects American diplomats in Kabul, to maintaining the current force of roughly 9,800, which would also allow American forces to continue training and advising the Afghans. 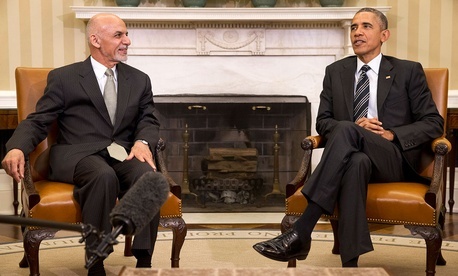 But the Obama administration is also likely to be wary of continued involvement in Afghanistan. Despite being in the country for 14 years, and training Afghan troops—an effort that has cost $65 billion—Afghanistan remains restive. The inability of Afghan security forces to hold onto Kunduz in the face of a long-planned Taliban onslaught are only likely to raise more questions about what the U.S. hopes to achieve in the country.